With more than 150 wineries, the sector of sparklings in Argentina is diversifying, creating new consumption trends. During 2012, exports enjoyed an excellent performance and Latin American countries were the driving force. The sector of sparkling wines, due to the growth they experienced, is today one of the most dynamic in the world business. The consumption in the country and the world has been a phenomenal boom, which is analyzed from different ways. Among them, the rise in consumption of young people and women stands out. On the other hand, this beverage is no longer consumed only during holiday seasons, and now it is chosen throughout the whole year. This phenomenon is followed very closely by Argentina and is reflected for instance in the record of sparkling samples submitted this year (220% more than in 2007) in the Argentina Wine Awards 2013. During 2012, the country produces 417,000 hectoliters, of which 48,000 were exported. Of this production, according to numbers coming from the National Institute of Viticulture, 150 wineries were responsible for this amount. Based on data from Bodegas de Argentina’s Commission of Sparkling wines, in 2012 Argentina makes 19% more in terms of volume than in 2011, reaching a total annual production of 55 million bottles. As regards exports, during 2012, Argentina has a turnover of USD 22,9 million, garnering a total of 465,449 9-liter cases, at an average price of USD 49.20. 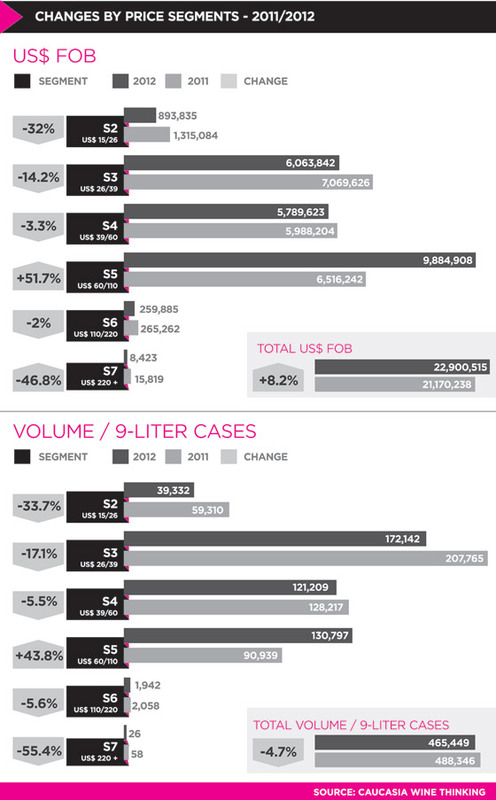 In comparison with 2011, Argentina grew by 8% in terms of turnover and 13% in volume. 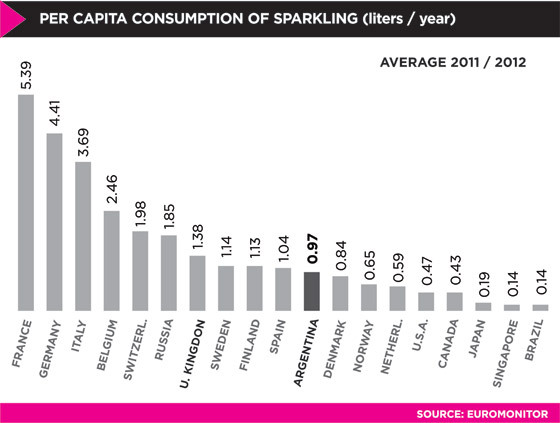 The markets propelling sparkling wine sales were Brazil, Chile and United States. Of these destinations, the second one had a better performance registering an increase of around 50% in value and volume; whereas the United States showed a considerable fall. Moreover, among the 10 main destinations, except for Japan, all countries are from Latin America, thus revealing its leadership. According to the segment, 61% of the produced and consumed sparkling wines, are brut and extra brut, whereas rosé and sweet products are coming behind with a fast growth (17.4% of the total amount). The boom of this category in Argentina has been encouraged by the benefits this sector obtained from the National Government. It is worthy to remember that in 2005, the concept of replacing taxes with investments was incorporated. This way, it was established that the payment of 12% domestic tax applied by the National Government to certain products was suspended for ten years in the case of sparkling wines. This was implemented only if wineries committed themselves to making investments exceeding at least 25% of the tax value to pay to the National State. Seven years after the creation of this Commitment Minute, the overall investment made in 2011 exceeded ARS 3 million and in the total amount during these seven years reaches ARS 200 million, a very positive figure. Young people have been the main driving force behind consumption in both Argentina and the world. They do not have fear of challenging the traditional stereotypes of Champagne. Rafael Squassini, director of Dante Robino, highlighted that the boom of the sparkling wine has been caused by the inclusion of new players and the insertion into non-traditional distribution channels, such as bars and discos (on-trade), as well as young consumers’ preferences for sparklings as an excellent option. This winery has managed to be considered among the 10 leading export brands by means of its brand Novecento, which is mainly consumed in the age segment from 25 to 50 years. Likewise, Gaspar Roby, winemaker of Navarro Correas, maintained: “sweet sparkling wines represent 10% of the market of this category, growing by 38% in volume and 100% in value. Unlike other products, sparklings are a fresh alternative for young consumers. In order to differentiate from competitors, these companies have decided to break into the market with nontraditional varieties. Let’s remember that Chardonnay (white grape) and Pinot Noit (red) are essential for the base. However, some wineries have started to use varieties such as Chenin, Semillón, Malbec, Viognier and even Torrontés. Daniel Pi pointed out that the winery’s sparkling wine ranges are based on innovation in varieties. “For instances, in Trapiche we use a base of Chardonnay and Semillón with a touch of unripe Malbec. This provides greater structure and acidity. Other varieties that we work with are Pinot Noir and Malbec in the case of the Rosé, while for the Finca Las Moras line, we employ early-picked Viognier and Syrah,” he explained. Likewise, Navarro Correas has also started to develop this style of products. Among the most noteworthy launchings stands the Navarro Correas Torrontés that, according to the winemaker, was very well received by the market. There exist two methods for making sparkling wines: Champenoise –or traditional- and Charmat. In Argentina, the Charmat method – process that forces the second fermentation to happen in a large stainless steel tank- suffered a loss of prestige as opposed to the Champenoise method – second fermentation in the bottle. As Daniel Pi highlighted, neither quality nor price are altered by the method used. Onofre agreed that quality does not rely on the method, but on a number of factors that involve the vineyard, variety, terroir and winemaking process. Another phenomenon that has emerged, and that has boosted growth, is that consumption is no longer seasonal. 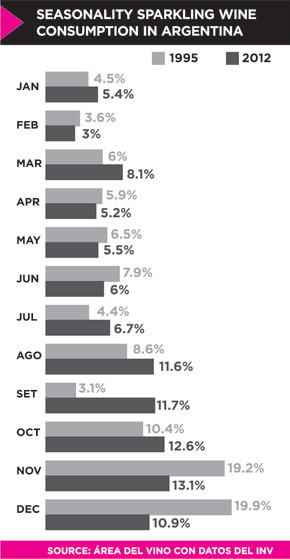 Though massive sales are achieved mainly during November and December, sparkling wine consumption expands to other months of the year. It is interesting to observe its growth during winter holidays - according to data on dispatches provided by the National Institute of Viticulture- and also throughout the year, not only during year-end celebrations. The phenomenon responds to a change in consumption and habits. Among them we can mention the search of new styles, like sweet and rosé sparkling wines, new varieties, new consumption occasions, and most important of all, the emergence of young people as boosters of this trend.